Background: The Coventry Consensus in 1998 recommended a single height measurement of all children at school entry or around the age of 5 years and prompt referral of children with height <0.4th centile for further assessment, in order to identify undetected and treatable asymptomatic growth disorders. Aim: To determine adherence and practicalities of following the Coventry Consensus recommendations in a community setting and the cost implications. Methods: Anthropometric data of all children born between September 1992 and August 1993 in the Rhondda and Taff Ely area and measured in school year September 1998 to August 1999 were obtained from the National Child Health System (NCHS) and analysed in July 2000. Results: Only 1592 (67.6%) of 2354 eligible children had their height measured. The NCHS could only flag up height data <2nd centile. 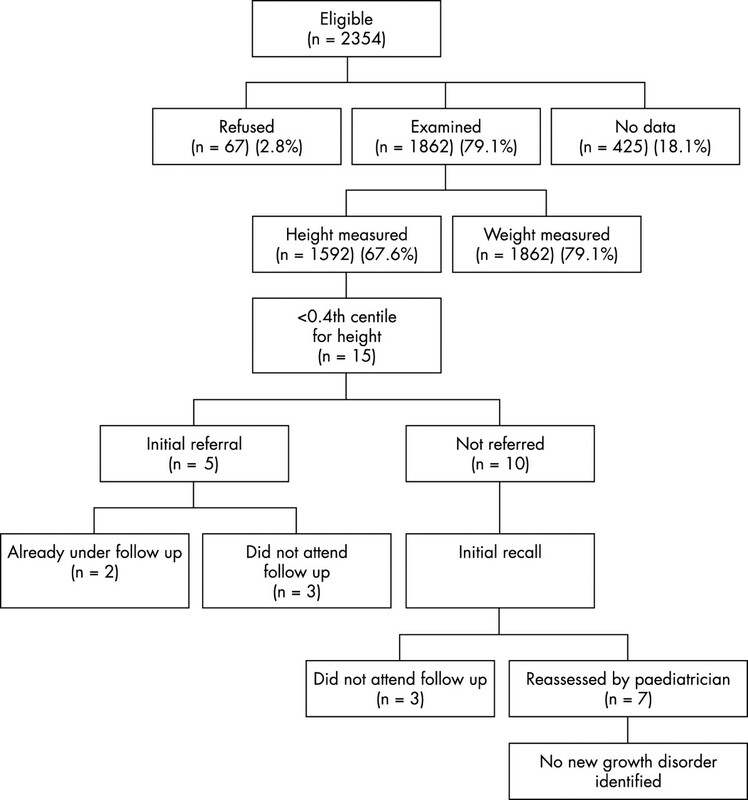 Only five of the 15 children with height <0.4th centile were referred initially. Height measurements were not transcribed onto centiles in 75% of the case notes reviewed. When initially recalled, six of the 15 eligible children failed to attend the referral clinic. No new growth disorder was identified in any of these children. A conservative estimate of the cost to the health authority was £14 550 (US$23 300; €20 500) per annum. Conclusion: The study shows poor coverage and compliance together with a lack of parental awareness that short stature could be a potential health problem even in asymptomatic children. For a low yield programme to be successful and cost effective at the national level, a near 100% coverage is required. Further training of professionals in growth measurement and interpretation along with a campaign to raise both public and professional awareness is needed. The routine measurement of growth in school children began 95 years ago when the Education Act of 1907 introduced periodic medical inspection of schoolchildren to address concern over their poor health.1 Responsibility for this examination has long since passed from the local authority to the National Health Service (NHS). However, the benefit of routine growth monitoring in apparently normal children in developed countries remains to be proven. Much money, and nursing and medical time is still invested in these measurements propelled by the hope of identifying defects and disorders that have been missed or not treated. However, increasing parental awareness, universal access to free primary health care, and child health surveillance should mean that by school entry few important physical disorders remain undetected, except in some special situations such as highly mobile families. Therefore, screening at school entry is unlikely to be effective unless growth measurements and data collection systems conform to very high standard. This study was undertaken to determine whether these recommendations are effectively followed in the community setting in a socially disadvantaged region of Rhondda and Taff-Ely, where resources are limited. As the number of school nurses in the area was very low—only 3.5 full time equivalent posts for 103 primary and 13 comprehensive schools—other healthcare personnel including health visitors were recruited to deliver routine school health surveillance in the region. All children born between September 1992 and August 1993 in the Rhondda and Taff- Ely area were included in the study. They were examined by a health visitor and a nursery nurse during the school year September 1998 to August 1999, using the portable Leicester Height Measure equipment. Local guidelines for referral were in accordance with the Coventry Consensus. Besides in-house sessions on guidelines and policies, there were no regular workshops on growth measurement training. At the time of the audit in July 2000, the National Child Health System was only able to identify children whose weight or height measurements were >98th or <2nd centile. The case notes of these children were then examined manually. As recommended by the Joint Working Party on Child Health Surveillance, height measurement data were plotted on the Child Growth Foundation (1996/1) 9-centile charts based on 1990 UK cross sectional reference data.8 Children with height <0.4th centile were thus identified. Their notes were then examined to document proper charting of growth data, referral pattern, and final outcome. The children with height <0.4th centile, who were not referred initially, were recalled. Appointments were given to the children and their parents to attend either a school medical clinic with a community paediatrician or an outpatient clinic with the consultant paediatrician in the local hospital/health centre, particularly if they were being seen there for any other condition. If they failed to attend after two appointments, health visitors attempted a home visit/telephone call to encourage the family to attend the next available clinic. In the clinic, the children were re-measured and their heights were assessed in relation to their mid-parent corrected heights (MPH), where available. This was calculated by adding or subtracting 7 cm to the average of the height of both parents for boys and girls respectively. Height velocity was calculated by comparing current height with previous record. The child’s height potential was regarded as within normal range if the height velocity was normal and the actual measurement was within the target centile range (MPH ± 10 cm). Laboratory investigations were only carried out if these results were abnormal or otherwise medically indicated. An analysis was carried out to determine the approximate cost of running such a service. There were 103 primary schools in the region. Taking into consideration that more than one session was required in some of the larger schools and also to cover absentees, it was estimated that 130 sessions were needed for measurements. The approximate cost of each session was estimated with the midpoint of the salary scales of the health visitors and nursery nurses and possible 10 sessions/week. Cost of equipment, training, and administration were added (table 1). Costs of further investigations were not included. Figure 1 illustrates the outcome of height screening at school entry in the Rhondda and Taff-Ely area in the school year 1998–99. A total of 2354 children were eligible for measurement. The number of children who had at least one measurement of either height or weight was 1862 (79.1%). The height was measured in fewer children—1592 (67.6%). No data could be obtained for 425 (18.1%) children and no cause was recorded as to the reason for such omission. Consent was refused by parents of 67 (2.8%) children. The average age at examination was 6 years (range 5 years 3 months to 6 years 8 months). Of the 1592 children in whom height measurements were available, 33 (2%) were identified as having height below the 2nd centile, with 15 children having height below the 0.4th centile. Outcome of height screening at school entry (Rhondda and Taff-Ely area, 1998–99). A paediatrician has now assessed 13 of the 15 eligible children. No new growth disorder has been identified. Of these 15 children, 10 were not referred and of the five referred, three did not attend medical examination even after two appointments, while two were already being followed by a paediatrician for related conditions (neurofibromatosis and arthrogryphosis). In a third of the children with height <0.4th centile, the weight was also <0.4th centile. Height measurements were not transcribed onto centiles in 75% of the case notes reviewed. The 10 children who were not referred initially were recalled; three of these children failed to attend the referral clinic even after two appointments. Of the remaining seven children assessed by the paediatrician, two had height >2nd centile on repeat measurement. Following further input by the health visitors, a paediatrician either in the hospital or in the community has now assessed 13 of the 15 eligible children. No child was identified to have any new growth disorder. Table 1 gives a breakdown of the approximate cost of height screening at school entry using health visitors and nursery nurses. The total cost was estimated to be approximately £14 550. The personnel cost of each session was calculated as £50 and £25/session respectively for health visitors and nursery nurses based on the midpoint of their annual salary and possible 10 sessions/week. The study focuses on the practical difficulties of growth measurement of schoolchildren using current healthcare resources. Since the target group of children who need further assessment is only 0.4% of all children at school entry, the programme needs to have a near 100% uptake in order to be successful in identifying rare growth disorders. The fact that the actual measurements could only be carried out in less than 80% of children probably reflects the difficulty faced with school attendance on a particular day (average 92%; personal communication, Rhondda Cynon Taff local education authority) and the opt-in consent policy of the NHS Trust. As there was a shortage of school nurses employed in the region, any opportunistic measurement of defaulters was impractical. The service therefore had to be provided by planned school visits by the health visitors and nursery nurses solely for the purpose of these measurements. It is of concern that only 67% children had their height measured. It was very surprising that the National Child Health System was not set up to identify deviation >99.6th or <0.4th centile. Therefore, a manual system had to be employed to identify the appropriate children for referral. It was interesting to note that growth measurements were not transcribed onto centile charts in nearly 75% of the case notes reviewed. Line graphs are known to be one of the difficult concepts to teach.9 Experience with postgraduate doctors in the 1970s suggested that a proportion could not complete a weight chart and even more would have problems in interpreting it.10 Alhough the situation is likely to have improved since then, all health professionals dealing with children need regular training in growth measurement and charting. These skills need to be audited on a regular basis. Of the 15 eligible children, six failed to attend the initial referral clinics despite two appointments being offered. There is possibly a lack of parental understanding that short stature could in itself be an indicator of a health problem in otherwise asymptomatic children. It is therefore important that parents are provided with more information on childhood growth problems. A conservative estimate of the cost to the NHS Trust was £14 550/annum. Employing more school nurses could have improved the uptake by more opportunistic measurements and reduced the cost of the programme, while at the same time catering to the diverse medical needs of children in school. The study clearly points to the fact that the training and the awareness of the primary health care professionals were inadequate. However, since this audit identified the problem, training sessions have been arranged with active help from the Child Growth Foundation and the tertiary paediatric endocrinology team to train the professionals involved in accurate measurement and interpretation of growth data. The National Child Health System is being redesigned to include the 99.6th and the 0.4th centile. Following a recruitment drive the number of school nurses in the region has risen to 7.5 full time equivalent. An audit to assess the impact of these changes on the overall coverage rate of the screening process, quality of growth data collection, interpretation, and appropriate referral is currently being undertaken. We realise that the number of children in the study is too small to make a judgement regarding the effectiveness of the screening process to identify rare growth disorders; but given the poor uptake and referral, it is unlikely to do so. It emphasises the need for better coverage, training, and awareness of primary health care professionals as an integral part of designing such an intervention. The intervention is only likely to be successful and cost effective with excellent coverage approaching 100%, proper charting and interpretation of growth data, and awareness of current guidelines. The detection rate of other significant medical problems besides height has not been considered in this study. Growth measurement in schoolchildren is often done routinely and in line with “custom and practice”, with little consideration of its implication for further intervention. A community based programme cannot be successful in the absence of proper data collection and awareness of the need for referral at the primary level. Audits of larger numbers of children will be needed to determine whether or not single measurement height screening, even if carried out effectively, is of benefit. We are grateful to Prof. DP Davies for his valuable comments and encouragement in preparation of the manuscript. Interdepartmental Committee on Physical Deterioration. Report, 1904. Hall D. Growth monitoring—consensus for discussion (http://www.pier.shef.ac.uk). Hall DM. Growth monitoring. Arch Dis Child2000;82:10–15. Child Health SubGroup, National Screening Committee. Report, June 2000 (http://www.nelh.nhs.uk/screening/child_pps/growth_chsgr.html). Hall DMB. Growth monitoring. In: Hall DMB, ed. Health for all children: Report of the Third Joint Working Party on Child Health Surveillance. Oxford: Oxford University Press, 1996:124. Fry T. Inch perfect? BACCH News Spring 2000:8–9 (http://www.bacch.org.uk). Vickers D. Inch perfect? A response from Lifespan Trust [letter]. BACCH News Summer 2000:14–15 (http://www.bacch.org.uk). Morley D. Growth monitoring. Arch Dis Child2001;84:90. Morley D. Will growth monitoring continue to be part of primary health care? S Afr Med J1994;84(suppl):15–16. “Oh dear!” must be the thoughts of all health professionals and families concerned about the growth monitoring of children. I am sure the picture in South Wales is little different from the rest of the country, but why is it that the British cannot measure, plot, and record the height of children? Is it either a lack of training or little interest in growth? We would certainly expect better from our local garage on taking the car in for a service, and a similar performance in industry would have led to bankruptcy a long time ago. While the authors should be congratulated for sharing their local problems, here we have a health district, deprived of school nurses, sending in untrained health visitors and nursery nurses on a one-off occasion. Any one not measured was not recalled on another day—no wonder there was poor coverage. Height was deemed to be of secondary importance to weight, as not all those weighed had their height recorded. However if this is so, then weight recordings alone are of little value without height and body mass index (BMI). Professional responsibility for measuring should include plotting on a growth chart, which is sadly lacking here, and the National Child Health System (NCHS) computer program should have been designed to reject obviously wrong recordings and to identify those whose height is below the standard cut off level of the 0.4th centile. What has been the integration of the national computer programmers and those health professionals working with them? Lastly, what of the interest of the health professionals when marked short stature is identified but no one ensures appropriate follow up? Surely this is a professional responsibility and should have been reinforced at the time the measurement was taken? Is it the system that is flawed? Perhaps, in the majority of occasions, a parent may not have been present and the Child Health Record not available to record and plot the individual measurements of height and weight. No explanation would therefore be given to the family of the relevance of the result at the time. What a mess, some may say, and is the effort worth it? The justification for growth monitoring is clearly laid out both in the Coventry Consensus1,2 and in the new 4th edition (2003) of Health for all children.3 It is not, as is said in the paper, just to identify undiagnosed growth problems, but also to act as a record locally and nationally of the nation’s health. For a start there is an explosion of childhood obesity throughout the country and all public health departments in the Primary Care Trusts (PCTs) and Strategic Health Authorities should be demanding to see this growth data for their population on an annual basis. Prevention of childhood obesity is a priority for the Coronary Heart Disease and Diabetes National Service Frameworks (NSFs) and hopefully also the forthcoming Children’s NSF. A measurement at school entry is a one-off marker of height, weight, and BMI. Of similar importance, a record of height and weight at this time can be recalled if growth problems are considered at a later date in the case of suspected pathology, psychosocial deprivation, or abuse and can be added to any other growth measurements recorded during that child’s life. The Coventry Consensus rejected routine measurements at multiple times through childhood (and this paper shows some of the reasons why), but argued for one, well performed, recorded and actioned measurement preschool and, most importantly, additional opportunistic measurements throughout childhood in primary care. The average child visits their general practitioner 15 times up to the age of 14 years, offering many opportunities for measurement. In the new 4th edition of Health for all children this has been changed to include all children with chronic health problems, those requiring prolonged follow up for any reason, and those in whom any concern over growth has been raised. This should then include, among the children, all those with asthma, especially if on inhaled steroids, all those with social deprivation, and all who repeatedly attend hospital. This would incorporate a large proportion of the childhood population at risk who may be missed at the moment. The technique of measurement, together with referral guidelines, is in print for all to follow.2 All those working with children in primary care should be trained to measure, plot, record, and identify when to refer a child with growth problems. One piece of important data that is often sadly lacking is measured parental height, which would enable appropriate allowances to be made where relevant. It has been suggested that this data could be routinely collected at the mother’s first antenatal visit, with the father encouraged to attend, and from this, inserted, via the computer record, into the Child Health Record for future use. The feasibility and validity of collecting this data warrants further investigation. So what now? The South Wales team have assessed their performance and are now educating the staff, improving the computer program, and will re-audit, thereby completing their audit cycle. We await their results with hopeful expectancy. However, all who read this article should ensure that a similar audit occurs locally. There is no point anyone undertaking a substandard programme. Growth monitoring requires a local champion; it is not difficult to perform following appropriate training. It must be done well and to all the recommendations in Health for all children. All these factors should be included in any financial analysis. Surely it should be “quality assured”, through the public health departments of the PCTs and strategic health authority who should request and disseminate an annual report on the structure, process, and outcome of results? Similarly the NCHS must be reprogrammed both to identify wrong input of data with a cut off at ±4 SD and also to flag up those children with height measurements <0.4th centile. Lastly, the professional colleges should ensure through their educational standards that all health professionals in training learn the importance and process of growth monitoring. We then would look on this programme nationally knowing that children are receiving appropriate care. Anon. Growth monitoring—consensus for discussion (http://www.pier.shef.ac.uk).